Adobe Flex Builder 3 - CIS 4372 HCI and Data Viz. Adobe Flex Builder Professional is an IDE used to create the front-end flash interfaces for web applications. 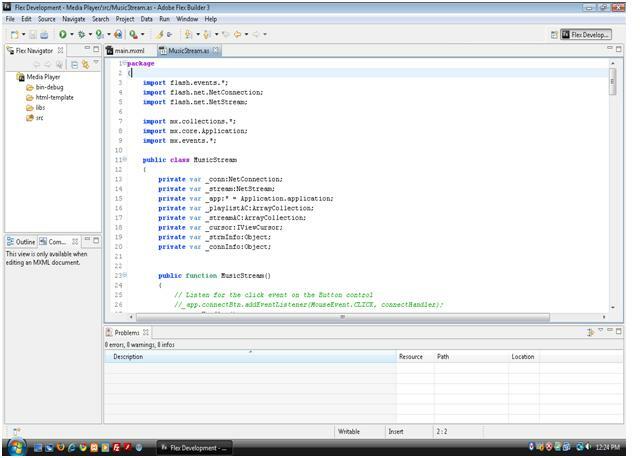 The IDE is a complex interface intended for use by skilled computer professionals. It requires a significant amount of instruction and employs a good deal of long-term memory to proficiently learn all if its functions. It is not designed for children or older, adult users. The main purpose of the IDE is to provide a software developer with a GUI interface to a powerful, syntactic, programming language. Therefore, the user must understand abstract development concepts in order to apply the interface for the purpose of building an application. Because of the amount and the nature of the information that the interface displays it would not be practical on handheld device and would be less useful if designed to comply with accessibility guidelines. It is not intended to be run from a network and is only accessible on the computer on which it is installed. The application is only available for Mac OS X and Windows machines and its installation is conditional on much higher system requirements than most other programs. It is only available in English and Japanese and is not easily themed.